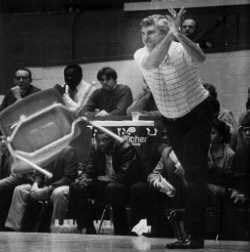 Congratulations to Bobby Knight on his much over due retirement. I think alot of people agree with me when I say he should have retired after he left Indiana. No way he was going to come close to a title at Texas Tech. 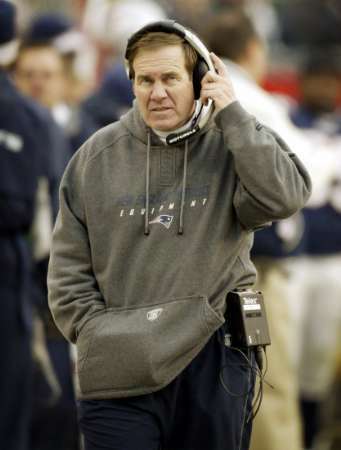 Classy move Belichick walking off the field before the game was over. Your a great example of how to be a good sportsman.....even in defeat! I understand that Brady and Moss are disappointed that they didn't win the super bowl, but for these guys to pull out of the pro bowl at the last minute is B.S. It's a slap in the face to the fans that voted you in. Just like a business exec. that doesn't want to go to that dinner party on Saturday night with his co-workers; but he goes anyway because he takes his job seriously and knows its the right thing to do. Brady and Moss should treat the pro bowl the same way. If they had won Sunday night, you know they would be in Hawaii on Sunday getting plenty of camera time! We don't care that you are threatening to sit out the season. 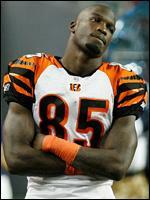 You wern't even the best receiver on your team....TJ Houshmanzadeh had 19 more catches and 4 more TD's than you! Quit being a headache and start being the leader the Bengals need you to be! This page contains a single article from February 5, 2008 9:35 AM. The previous days article was GREG GAMBLE'S FREE ATS PLAYS.